I’ve never had a Facebook account and I’m pleased about that. I’m certainly not anti-tech. I was an early advocate for the internet, started blogging pretty much as soon as it was possible, built web-sites, built digital resources, helped establish online communities and took up tools like OneNote, with gusto. In fact, the raison d’être of this blog has been about the effective implementation of technology in learning. But, I’ve had some second and third thoughts recently about the rise and rise of big-tech, in terms of the social manipulation we’ve seen bear fruit in data mining and election manipulation, not to mention the more personal but just as devastating bullying and manipulation that I see occurring daily on a micro-level between students. And, I’ve seen more flaws in the glass than I would have expected and, moving from a school environment where technology flows like water, to a more typical, and more challenged, technology environment where I’ve been forced to reflect on what that looks and feels like for most teachers and students most of the time. Things don’t always work and teachers are swamped by workloads and increasing levels of accountability, risk-management and administrative tasks. I’m not surprised some stop trying. And there’s some problems with the model too. We are an iPad school for the Years 7–9 students and BYOD after that. Most students ditch their iPad and bring a MacBook Air or a PC after that. A significant minority write in exercise books with pens. I’ve blogged before about iPads in learning and the tension between having the Cambridge, Oxford or Pearson text book on the iPad, turning it into a glorified textbook, and the students needing to write in exercise books with pens. Split screen doesn’t work for this. I don’t think that it would be any better with a Chromebook. So, there’s always been something awkward about the device/s for subjects where the textbook is paramount. In my subject, Literature, where students normally have a hard copy of a novel or play, the device works better, and I’ve had success in the past, and this year, in getting students to see the value of OneNote, which is pleasing. However, the revelations about Facebook’s use of private data concerns me, as does the same for the Google suite of tools. A while ago I argued strongly for a move to an educational version of Gmail for our school; I’m not sure I’d make that case now. If you’re using Google Apps for free (or Facebook for free), the model is that your data is monetised, you are the product, as Tim Cook pointed out again recently. I wouldn’t have predicted, five years ago, that I’d be arguing for Apple or Microsoft (which looked tired and corporate) ahead of the ubiquitous Google. Similarly, I’ve resisted calls to ban and block phones and devices to stop cyber-bullying. Bullying is bullying I argued, focus on the behaviour, not the mode. But, there’s no doubt that putting sophisticated communication tools, and social media accounts, in the hands of thirteen year olds is a recipe for enabling bullying and exclusion way beyond the playground at lunchtime. There is not much push for Facebook in learning (thankfully) but our school uses its Facebook account to communicate with parents much more energetically than our own intranet, and groups of students, including my own class, set up their own learning networks on Facebook. What does that model? And who benefits from the students, and the school community locked into a Facebook model of news and communication? Not only are big-tech corporates poor at monitoring and protecting data and privacy, in many cases their entire business model is based on the reverse; selling that data to advertisers and beyond. It’s a challenge for our times, the #deletefacebook hashtag has resonance in schools too, and what we exemplify and model. I had thought that the days of RSS and building our own web sites was behind us. Maybe not. Certainly, the old English Expression skills of critical thinking and high levels of literacy, are more important than ever. One thing is clear. While we may have thought of hopefully, in the beginning of the Internet, that this was liberating, connecting and democratising, has turned, as big-tech companies have become bigger than government, un-elected and un-accountable, into something divisive and anti-democratic. What do we do about that? I’m not a huge fan of the new Apple News app, and I don’t expect that Nine News is going to break new ground in education news I’d value. But, even by those un-lofty standards the article below that appeared tonight was a new low. This was the article in full! (More behind the paywall?) Note, both the assumptions are flawed: the view of current school as kids in rows AND the radical future, ie Wifi. 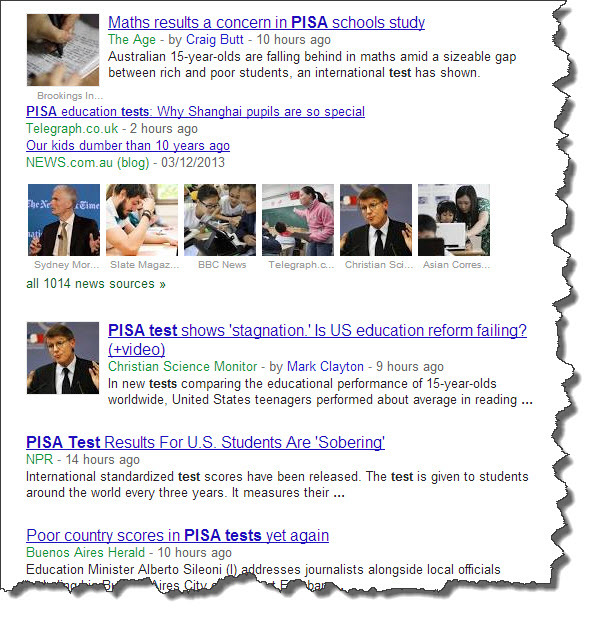 PISA results were released this week. The media has enjoyed it a lot. I have some strong reservations about the validity of the testing, the meaningfulness of national comparisons and the subsequent media league tables, teacher-blaming and contrived anguish in the Murdoch press that inevitably follows: ‘Our kids dumber than ten years ago.’. Yes, I think this really helpful to all concerned. I could put up a list of links pointing to articles that talk about this stuff, but look it up. The symposium is an excellent opportunity to hear from leading international specialists about high quality education resources and their outcomes. This conference is feature packed and focusses on the pedagogical, economic and strategic value of Australian education and how it will shape the future of Australia as a highly skilled, globalised knowledge economy. I think I was pretty much the only one from a school perspective so I was keen to strike a balance between the ‘big-picture’ needs, aspirations and work of teachers as a collective as well as the daily life of the digital resourcing in schools. Which was a challenge. While schools and publishers are coming to grips with a changed paradigm and new possibilities for everything from libraries to textbooks, teachers are working with their students in the classrooms to create quality learning resources together. I basically argued that teachers influence educational resourcing by ignoring offerings, by collaborating on what they find so that good resources ‘tweet their way to the top’ and by making their own resources, through a rang of (mostly) web tools. I was keen to emphasise the idea of the ‘classroom community’ or the Will Richardson idea that ‘networks are the new classrooms’. Then, it was back to school to sit in on the planner meeting making sure the rooms for the parent-teacher-student conferences next year don’t clash and that reports can be uploaded in time. Such it is for anyone who works in schools. Watch out for those computers: they might break down! I thought it was great to see a Principal of a government school brave enough to come out this week and remind us all how silly it is (in this day and age) that we actually get students to hand-write long (ish) pieces for important assessment, and call this a contemporary education. Actually, Michael Phillips from Ringwood Secondary College didn’t need to remind me. I’ve told anyone who was foolish enough to stop and listen that the Year 12 exam must be about the last time many of these students will ever write anything substantial, thoughtful and structured by hand. And, it’s not as if they’ve been handwriting through much of their school life. My students, like the students at Ringwood, have been working with computers extensively and in a sustained way for most of their school assessment through years 7 to 10. Then we get all olde-worlde and put the computers away so students can get their pens out. What? Or more precisely: why? When I’ve raised this with people from VCAA they’ll argue it’s about equity. Not everyone has had access to a computer so no-one can use one in the exam. And, if pushed, they’re worried about security too in a high-stake exam. But what about equity for students who have been learning, thinking and writing with these tools? ‘Put them away sonny, this is important’. Or equity for those students whose hand-eye coordination results in writing that doesn’t look as good as someone else? SIX weeks before VCE exams, students at Ringwood Secondary College dump the computer keyboards they have used since childhood and start practising their handwriting. In 2007, the Rudd government launched its Digital Education Revolution, pledging every year 9-12 student would have a computer by the end of this year. Given this investment, Mr Phillips said there was no reason why there would be insufficient computers in schools for VCE students to sit their exams. He said assessment should be more sophisticated than students regurgitating facts they have memorised in essays. Instead, exams should test how students solve problems and research and analyse information within time constraints. 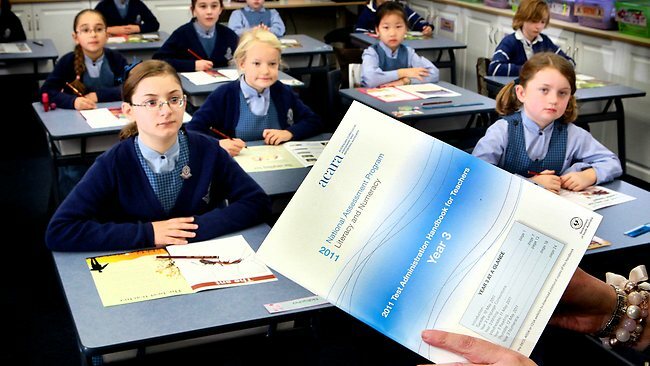 Victorian Curriculum and Assessment Authority chief executive John Firth said in order to be fair, VCE exams needed to be sat under exactly the same conditions across the state. He said there were security risks with the use of technology and the possibility computers could break down. However, using computers was certainly an issue that had been raised, and the VCAA was keen to conduct trials using word processors in exams in lower year levels. ”Our strategic plan over the next three years is we want to make some progress along these lines, but we wouldn’t start with [VCE] English,” he said. *Okay, not the best tie-in but I was looking for an olde-worlde illustration and this is the best I could come up with! Alongside the box of ‘things schools should be teaching’, a new box of things schools should steer clear from: in this case, teaching about climate change. Apparently, kids run the risk of being terrified by the ‘doomsday’ scenarios that the government is providing in its kitbag of resources for schools. Australian National University’s Centre for the Public Awareness of Science director Dr Sue Stocklmayer said climate change had been portrayed as “Doomsday scenarios with no way out”. Dr Stocklmayer said she was not a climate-change sceptic but worried that “too much time was spent presenting scary scenarios, especially to young people”. “(Children) feel incredibly despondent and helpless in the face of all this negative information,” she said. “To put all of this before our children … is one of the most appalling things we can do to (them). Murdoch reporter to Psychologist: Do you think some kids could become anxious given all this talk about climate change? And, if you really wanted to alarm kids, you might show them the state of the parliamentary debate on all this. I started off all indignant when I ripped Miranda Devine’s latest piece of folksy wisdom out of the Herald-Sun on Thursday but in the end you just have to laugh at the dross that comes out of the conservative media’s best and brightest day after day as if someone is paying them to do it! 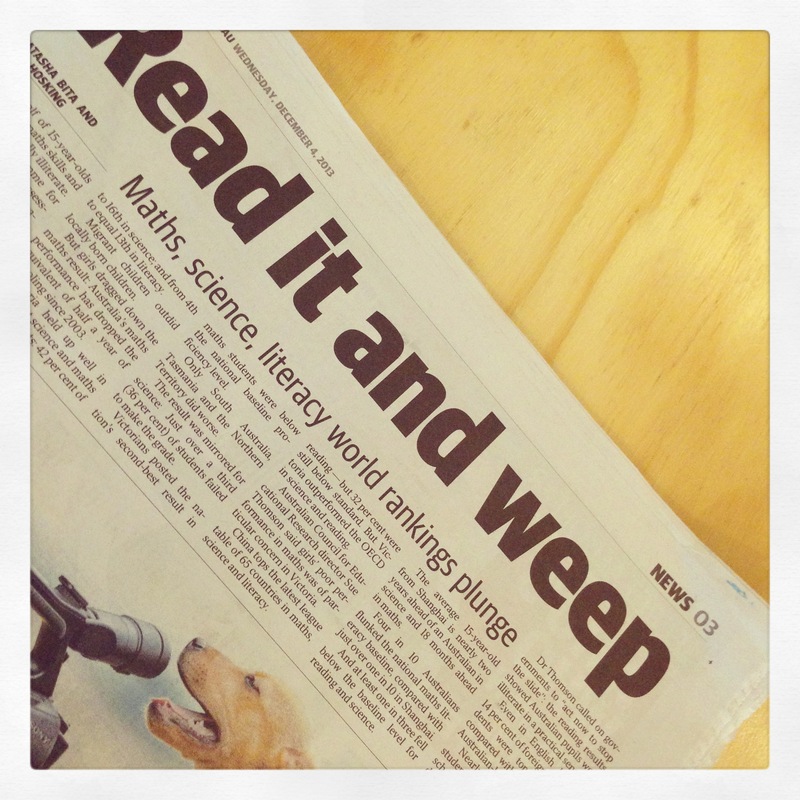 After failing the 20 per cent of children who leave school functionally illiterate, we finally see the truth. Which students have sat through two years of boring lessons without learning to read and write? NAPLAN knows. Which teachers are adding little value year on year to the students in their classroom? NAPLAN knows. Which schools are failing to improve their students’ test results? NAPLAN knows. NAPLAN knows what evil lurks in the hearts of men. Just like the shadow did! How do they think of this stuff. Has Devine been channeling 1930s pulp fiction? You be the judge!